I recently downsized from a full 4 drawer filing cabinet to a half empty 2 drawer one. It was all part of moving into my new office and feels great! While I store alot digitally now rather than the paper, there will always be some things that will need to have hard copies stored. In this video I go through the why and HOW I sort and decide what to keep, archive, or shred. Here's the "before and after!" 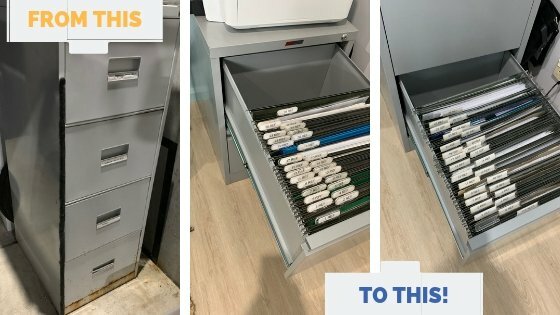 A way to stop your drawers from bulging in the first place is to regularly remove out of date files everytime you put something in - "Cut the Fat from your Filing Cabinet"
Tips for "Making Filing Paperwork Easier" including separating and naming categories, and keeping your tools handy.